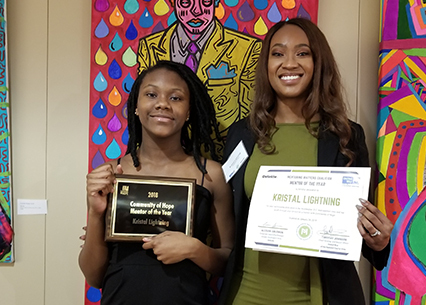 January is National Mentoring Month and we want to congratulate Mentor Kristal Lightning! We are thrilled to share that not only is Kristal Community of Hope's 2018 Mentor of the Year but she was also chosen as one of the three United Way of the National Capital Area and Deloitte's Mentoring Matters Coalition Mentors of the Year! She was selected out of a pool of over 25 organizations who host mentoring programs throughout the DC-metro area. Kristal has been paired with her mentee Moena since September 2015. She wanted to be matched with our youngest mentee who was eight at the time, so they could grow and learn together as the mentee matured. “It’s been very special to be a mentor to her [Moena] because I get to see her grow in ways from a child to a teen and then hopefully we will continue this relationship as she grows into a young woman,” said Kristal in a recent interview on mentorship with WHUR 96.3. The two set a variety of goals together including: improving Moena's reading skills, building friendships and positive relationships, decision-making, and exploring new activities and foods. Kristal easily picks up on Moena’s interests and talents and looks to find ways to build on those. She encourages Moena to use technology to enhance her current favorite activity - drawing, designing, and creating personalities for anime characters! Kristal finds workshops around the city for them to attend together to broaden Moena’s horizons and talents. Moena enjoys the one-on-one time the most. She loves the fact that Kristal pays full attention to her, and she doesn’t have to share her time with her older sisters or anyone else! 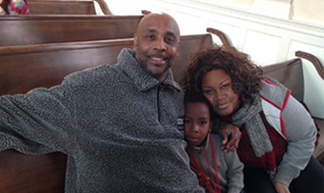 Please visit our website today to learn more about our mentoring program and how you can get involved, www.communityofhopedc.org/mentor.